and internationally recognised authority on the Beatles. Holder of the Beatles Brain of Britain titles at the 1991 and 1992 Liverpool Conventions. Regular contributor to the former Revolver magazine, editor of the London Beatles Fanclub magazine Off the Beatle Track, correspondent of the British Beatles Fanclub Magazine. He interviewed Kenny Everett, Alan Parsons, Alistair Taylor, The Rutles and many others. Beatles consultant on Sky News and other TV and radio stations. 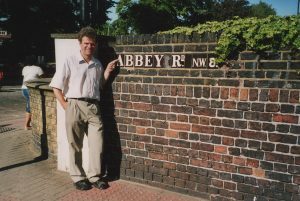 Richard has been guiding Beatles tours in London for over 15 years. His tours have been featured on Newsnight, Sky News, BBC Breakfast News, BBC London and London Tonight in the UK. CNN, CBS Evening News with Dan Rather, and ABC News in the US, as well as in newspapers around the world, including the London Evening Standard, The Guardian and the Independent in the UK; the New York Times, Chicago Tribune, Miami Herald, Los Angeles Times, San Francisco Examiner and many others in the US. Previous clients have included EMI, The Rock, Roll Hall of Fame and many others. A consultant on the A Hard Day’s Night DVD and the Long and Winding Road DVD. Richard has written the Guide to The Beatles London, now in its second edition. More details here.